05-Mar-2006 — I have known about this confluence for some time since I discovered the site, and have been meaning to go visit it since it is only 9.42 km from my home, so on this sunny and cold winter-day I decided now was the time to do it, instead of staying holed up inside all day. 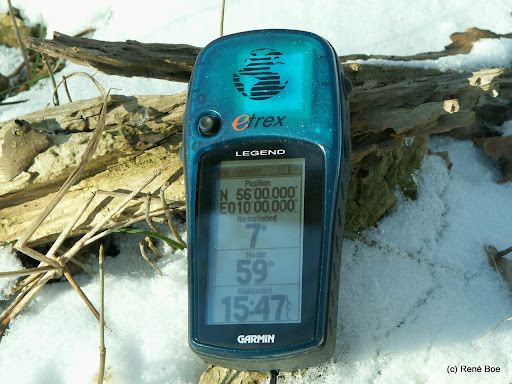 I had been geocaching on the 2 previous days so I had all my warm clothes ready and I just needed to make a waypoint at the confluence to guide me to the spot. The last visit by Wolfgang & Silke was made on a rainy and overcast september-day when the light wasn’t too good and the wet leaves on the trees made for bad reception, so today I figured I could get some nice photos right on the spot. I was able to park my car on the shoulder of the road about 150-160 meters from the confluence and then walked across the field to the small wood where the confluence was located. As I neared the spot I could recognice the place from the previous visitors photos. After a little moving around I found the approximate spot and proceeded to take the required photos. And since it was a sunny day the view was great across the snow-covered area. This was a great excuse to get out and get some fresh air. Take a look at a map after the break.